Aaron Lebedeff was clearly the most popular entertainer at the height of his group's vaudeville stage in the 1920s and also the most influential with his audience. Unlike his Swedish and Italian counterparts, however, Lebedeff's popularity rested less on his characterizations than on his stage presence, which was marked by unbounded exuberance and dash. The message he conveyed, however, was similar to that of the other vaudevillians, dwelling on nostalgia for the shtetl, the old country village, as a generic rather than a specific locale and thereby remaking his immigrant audience into a homogeneous mass. Lebedeff was fortunate in entering the Jewish vaudeville in 1920, when the Yiddish comedy stage was entering its era of greatest popularity, with large houses, prolific composers, and a growing demand for supporting actors and actresses. As an art form, the theater had emerged originally after the turn of the century, through the efforts of Jacob Adler, Jacob Gordon, David Kessler and others, but it did not assume its more popular character until after Gordon's death in 1910. Although a group led by Maurice Schwartz revived the more sophisticated drama in 1918, the popular theater continued to grow, attracting numerous patrons. The leader of that latter genre and the major promoter of early Yiddish vaudeville was Boris Thomashevsky, who as noted above opened his magnificent National Theater on the Lower East Side, at Second Avenue and Houston Street, around World War I. About twenty other Yiddish theaters in the city competed with the National for good acting talent, a situation to which Thomashevsky responded by becoming something of an impresario. As one contemporary composer put it, the popular theater was in need of fresh faces in 1920. One of Thomashevsky's "finds," arguably his greatest, was Aaron Lebedeff, a Yiddish comedian who at the end of the war was barnstorming in China. It is not clear precisely how Thomashevsky located Lebedeff. He most likely contacted him in Asia, though he may have waited till Lebedeff arrived in New York in 1920. It is certain that before coming to America, Lebedeff already had established a solid reputation as an East European comic, the "Litvak Komiker" (the Lithuanian Yiddish comic)—a title given him on the basis not of his nativity (he was born in Homel, White Russia, in 1873) but his material. That distinction is important; even before Lebedeff arrived in America, he had already based his Yiddish comic material on a particular region. Even in his earliest years in Russia he was devoted to a life on the boards. He loved music and often sang with the local chazzan Boruch Dovid, rejecting his family's plan for him either to enter their clothing business or become an apprentice to a skilled trade. As a youth, he frequently ran off to nearby cities such as Minsk and Bobruisk to appear with small Russian theatrical groups, but his excursions always failed, and he had to return home. Later, however, he became more successful in music and dance presentations, in operettas especially, and even opened his own dancing school in Minsk and joined musical and dance groups. By 1912 he had established a reputation as the Lithuanian comic in large cities throughout the region, including Warsaw. He played in the Itzkhok Zandberg’s theater in Lódz. He got married with Vera Lubow and at this time joined the Avrom Fishzohn troupe. When the Russian army in World War I took him further afield to Harbin, Manchuria, he performed for the officers in the garnison. It is also said that he performed before Kerensky, Lenin and Trotsky, but no details of such performances have yet come to light. After the Russians left the Allied side in 1917 he entertained American Red Cross officials stationed there, and when the war ended he and his actress wife Vera toured Russian Siberia and China. He was appearing in Shanghai when Thomashevsky sent him an invitation to perform in New York City; leaving his wife (she went after that in America and became a popular actress. They didn’t have children) behind to complete their engagement, he set off for the major Jewish American city. His October 1920 debut at Thomashevsky's National Theatre was memorable—according to one member of the audience, "America had never seen anything better than what we saw that evening." 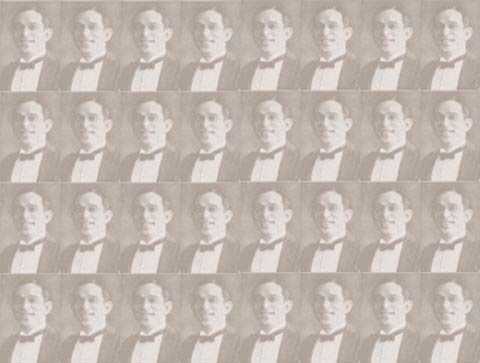 Lebedeff was an instant hit, for the same reason that he would soon become the star of Yiddish musical comedy in America: his winning, charismatic personality. He projected an extraordinary exuberance and energy, engaging his audience immediately and holding it throughout his performance. He also had a powerful singing voice, which further arrested attention and perfectly suited the acoustic demands of the theater and records. Completing Lebedeff's dramatic abilities was a remarkable zest for improvisation, as he clowned and danced his way through the performance. By the end of the 1920s Lebedeff was not only the most popular Yiddish vaudevillian but was also composing much of his own musical material and directing stage performances. He was therefore more than an individual actor; he was in fact the leader of a troupe of Yiddish players. From the mid-1920s to the 1940s in the summer off-season, Lebedeff would regularly lead a contingent of actors and actresses to the Catskills to perfect their dramatic skills. Lebedeff's unrivaled popularity was rooted in more than his magnetic stage presence. Unlike some of his colleagues, he often performed outside New York, thereby becoming a truly national figure. He told interviewers in Chicago in 1925 and 1929 that he liked to tour as a way of keeping up with his audiences and becoming acquainted with the younger generation. By keeping his stage presentations fresh, he was able to retain the interest of Jews of both immigrant and American generations in Yiddish culture .He became well known in the Midwest, first appearing before Detroit Jewish audiences in the 1923–1924 season and returning almost annually into the 1930s. Lebedeff was said to be "always a favorite of Detroit Jewry" in that era. He also played often in the major East Coast cities, including Boston and Philadelphia. His huge output of records in the 1920s, about eighty in all, mostly for Emerson, Brunswick, and Vocalion, also aided substantially in making him known nationally. Because he usually cut each record immediately after the New York performances in which a particular song was introduced, people everywhere quickly became acquainted with him and his dynamic presence. Like the entertainers from other ethnic groups, Lebedeff met a psychological need for his audience, which was ever-nostalgic about the old European homeland and yearning for a romanticized image of the place from which they had come to America. To illustrate this theme, which was developed by many Jewish entertainers besides Lebedeff, we might consider a song with which he had little connection, "Die Grine Kusine," introduced in 1922 at the Grand Street Theatre and widely featured in cafes and theaters afterward. Abe Schwartz and Hyman Prizant composed the ballad, which was issued by a prominent Yiddish house, J. and J. Kammen. It related the sad tale of a naive, happy country girl with "cheeks as red as oranges, hair in golden curls, teeth like pearls, eyes like twin doves, and lips like cherries," who left home for America where she met a boy and her ruination. Lebedeff undoubtedly knew his immigrant audiences' love for the message of "Die Grine Kusine," with its evocation of the innocence of the land of origin in contrast to the complexity, anxiety, and uncertainty of America. "Liovke Maladetz," the very first comedy in which he appeared, and the one that would set his name and style, played on that theme of alienation and unease, recounting the adventures and misadventures of an unsophisticated but good-hearted rascal in Russia who encounters but eventually conquers adversity. While not about immigration per se, it did convey a certain universality. Any Italian immigrant audience watching Farfariello or Swedish audience attending an Olle i Skratthult skit would have found the concurrent Yiddish theater and even Lebedeff's role surprisingly familiar. In realizing their three similar transitions, all were clearly becoming more homogeneous. A common immigrant identity was emerging. While not every role Lebedeff played in the Yiddish theater dwelled on the theme of European innocence and American dangers, Lebedeff became identified as a purveyor of village or small-town characters. His title as the Litvak Komiker stuck with him in the Lower East Side theaters, where entertainers often drew humor from the semi-serious conflict that had arisen between emigrants from the general area around Lithuania—the "Litvaks"—and those from the more southerly region around Polish-Ukrainian Galicia—the "Galitzyaners." Throughout his career, Lebedeff almost always projected the provincial character of Yiddish-speaking Jews, as did many Jewish American composers of the era, whose music either catered to or actually inspired the audience's continuing desire to romanticize its provincial origins. One of the leading younger writers of musicals, Abraham Ellstein, probably was speaking for many of his colleagues when he expressed the view that all Jewish composers should write about their people's life in the past, whether in biblical Israel or the East European shtetl. Much of the material that Lebedeff used on stage and in song, even into the 1940s, continued to carry his listeners back psychically to their home in the Old World, whether that home was Lithuania, Poland, Russia proper, or Roumania. The titles themselves of a few of Lebedeff's popular vehicles in the twenties and thirties, by such composers as Herman Wohl, Sholem Secunda, Alexander Olshanetzky, Joseph Rumshinsky, and Abraham Ellstein, suggest the pervasiveness of this nostalgic theme: "A Wedding in Odessa," "Yankel in America," "Country Boy," "A Wedding in Palestine," "Motke From Slobodke," "Caucasian Love," "Russian Love," "A Village Wedding," "An East Side Wedding," "The Roumanian Litvak," "The Roumanian Wedding" and "Der Litvisher Yankee." Of course, as the leading performer in popular Yiddish musicals Lebedeff had a formative impact on his immigrant audience, furthering their romanticized image of their origins. He also had an impact on a wider public, much larger than the audience that attended the theater. He often sang in places other than the theater, in less formal surroundings such as cafes and restaurants, at benefits, and above all on records. In rendering those popular songs, he was also rooting listeners to their provincial past and thus providing them with a new identity as Jewish Americans. Representative of this genre of popular Yiddish ballads is "Slutzk Mein Shtele," with lyrics by Lebedeff set to music by Herman Wohl. The piece recalls one particular village, invoked as a sort of generic hometown. Lebedeff recorded it in 1925. 66 Other works exemplifying the artist's frequent regional emphasis were "A Khazendi in America" (1928), in which a Litvak, Galytzyaner, and American judge a cantor, a singer or chanter of liturgical music and prayer; "Vayt Fun Der Heym" (Far from home) (1926), an emigrant's lament; "Odesser Liedel," and "In Odessa," songs about the Black Sea port also recorded in 1926; "Petrograd" and "Roumanische Karnatzlach" (Roumanian sausage) from 1927; "Gib Mir Bessarabia," which glorified life in the province on the Russian-Roumania border; "Aheim! Aheim!" (Home! Home!) (1933), which deals explicitly with immigrant homesickness ("In the Old World on the green fields, I was never sad; but since I am here [in America], I haven't had a relaxing moment. . . . I miss my beautiful little calf . . . [and] romping with the chickens. . . .Oh! . . . send me back home! "); and "Galitzye," which told of a home province along the border of southeastern Poland and which Lebedeff often delivered at benefit performances in the late 1930s. Other songs that Lebedeff performed combined sentimentalizing of a locality with the character for which he is always remembered—the devil-may-care free spirit who loves life and all its sensual delights, as in the skit "Liovke Maladetz," the kind of person the audience itself would like to be or know. His usual costumes of Russian rebeshko and boots or formal attire with straw hat and cane endeared him to his audience—Molly Picon referred to him as "our George M. Cohan . . . dressed like a dandy," and others called him the Jewish Maurice Chevalier. The song "Tsen Kopikes," which Lebedeff popularized in 1923, is a young swain's account of the ways he will use his money to court his sweetheart—when he finds one. Other songs dwelling on love and the appetite were "Ich Hob Lieb Di Meidlach" (I love the ladies) (1929); "Hot Dogs and Knishes" (1926); and "Dudky Brat" (1923), which advises people discouraged by Prohibition to take heart—one can still get drunk. One song, however, stands out as Lebedeff's hallmark, deeply moving his Yiddish audience and exercising the exuberance and energy for which he was famous. If you want more information, please go on the page ‘Roumania Roumania’. Certainly it is tempting to overestimate Lebedeff's impact. He was popular for a long time as he continued to perform in revivals in the 1950s until his death in 1960. But his heavy cultivation of nostalgia was not unique in the Yiddish popular theater, where audiences thrived on tales of traditional life based more on romance than reality. Overall, the Jewish popular stage in the interwar period and its musical-comedy themes led by Lebedeff and others helped their group, fragmented at first religiously, nationally, culturally, and by social class, find its way two decades later to a more homogeneous community. When Lebedeff died the November, 8th 1960, the Yiddish theatre and the United States lost one of their “ stars ”. 7 April 1921 in Shloymke af Broadway by Yitskhok Lesh. 13 April 1922 Kalmanovitsh's Arontshik un Solomontshik (music by H. Wohl). 26 January in Yisroel Rozenberg's Yankele litvak (directed by Lebedeff and S. Rosenstein). 30 March 1926, Yitskhok Lesh's Volodke in Odes (music by Perets Sandler). For the 1926-27 season Lebedeff and the National Theatre troupe transferred to the Liberty Theatre in Brooklyn which opened 22 September 1926 with L. Freyman's Shloimke vert a khazn (music by Perets Sandler) and then at the Public Theatre where 15 April 1927 Lebedeff staged Aaron Nager's Der kleyner milyoner (music by Sholom Secunda). 29 March 1929, Yisroel Rozenberg's Hulye kaptsn (music by A. Olshanetsky). For the 1929-30 season Lebedeff was engaged by Chicago's Londale Theatre, making a guest appearance at the end of the season at New York's National Theatre where 9 April 1930 he staged Kalmanovitsh's Motke fun Slobodke. 4 March 1932 William Segal's Raykhe kaptsonim (music by H. Wohl). For the 1932-33 season Lebedeff was engaged by Kessler's Second Avenue Theatre (director M. Maks) where 10 October 1932 he produced Avrom Blum's Der groyser suprayz (music by H. Wohl). At the end of every season Lebedeff and the troupe with which he had been appearing would go on tour through the American provinces. Apart from the plays already mentioned, Lebedeff has on various occasions played in America Maks in Goldlfaden's Beyde kuni lemels, Di bobe yakhne by Goldfaden, Vorobeytshik in Gordin's Der vilder mentsh and in Khone Gotesfeld's comedy Morgen.